"This has become our favorite side dish to go with soups and main dishes. Doesn't need much salt. 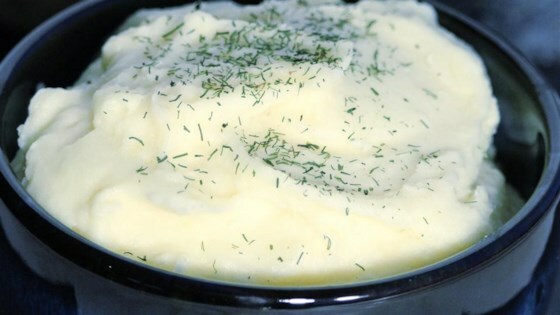 Celery root is an awesome discovery for flavor - these are the best mashed potatoes I've ever tasted." Place potatoes and celery root in a large pot. Pour in enough water to cover. Bring to a boil; reduce heat and simmer until tender, about 20 minutes. Drain and return to the pot. Cook over medium-high heat until dry, 2 to 3 minutes. Remove from heat. Pulse potatoes, celery root, and garlic in a food processor in batches, adding almond milk and olive oil as you pulse to reach desired consistency. Transfer to a large bowl. Stir in chives, salt, and black pepper. Great tasting mashed potatoes, gravy optional.